So, is this Real? Fake? Real Fake? Someone emailed this to me. VANCOUVER, B.C. - In order to prosecute the 9/11 perpetrators under the 9/11 Independent Prosecutors Act, Independent Scientist/DU Radiation Expert Leuren Moret and International Lawyer Alfred Webre will call for the establishment of an International Citizen's 9/11 War Crimes Tribunal, in a public announcement to be made at the Vancouver 9/11 Truth Conference on Sunday June 24, 2007. According to Moret and Webre, 9/11 was a False Flag Operation by an international War Crimes Racketeering Organization, to provide a pretext to engage in Genocidal & Ecocidal Depleted Uranium (DU) bombing of Central Asia (Afghanistan and Iraq) in order to secure vast oil and uranium reserves; to roll out a Terror-based National Security state-system world-wide; and to implement the final stages of a world Depopulation policy. The International Citizen’s 9/11 War Crimes Tribunal would be convened under the jurisdiction of the Kuala Lumpur International War Crimes Tribunal, established in February 2007 as a permanent citizen’s Tribunal by The Perdana Global Peace Organization, chaired by Tun Dr. Mahathir bin Mohamad, former Prime Minister of Malaysia, who is the first prominent world leader to take up the DU radiation issue. Alfred Lambremont Webre JD, MEd, an international lawyer and Member of the Pro Tem Committee for the Kuala Lumpur International War Crimes Tribunal to be held in 2008, will make the announcement in an address to the Vancouver 9/11 Truth Conference, on the issue of "The International 9/11 Citizen's War Crimes Tribunal: The 9/11 False Flag Operation as a War Crime under International Law." The 9/11 Independent Prosecutor Act appoints an Independent Prosecutor under the authority of Article III(3) of the U.S. Constitution to prosecute Treason against the United States of America by U.S. President George W. Bush, U.S. Vice President Richard B. Cheney, U.S. Secretary of Defense Donald H. Rumsfeld and other John and Jane Does for planning and carrying out the acts of treason, as defined in Article III(3) of the U.S. Constitution, by conspiring to carry out, carrying out, and/or causing to be carried out an armed attack upon these United States on September 11, 2001, as part of a False Flag Operation. Article III of the U.S. Constitution provides that, "Sect. 3. Treason against the United States, shall consist only in levying war against them, or in adhering to their enemies, giving them aid and comfort...."
I. The attacks of 9/11, as portrayed in the official account, could not have succeeded if standard operating procedures between the Federal Aviation Administration (FAA) and NORAD had been followed. The Pentagon, under the leadership of Donald Rumsfeld, has provided three mutually inconsistent accounts of NORAD’s response, which means that at least two of them are false. Moreover, the third account, articulated by the 9/11 Commission, is contradicted by a wide range of facts, including evidence that the FAA had notified NORAD in a timely fashion. There must have been stand-down orders, and these could have come only from the highest levels of the Pentagon and the White House. II. Overwhelming evidence exists that the collapses of the Twin Towers and Building 7 were instances of controlled demolition, and/or of the application of exotic weapons such as land-based, air-based or possible space-based Directed Energy Weapons (DEW). But al-Qaeda operatives could not have obtained the needed access to the buildings to plant the explosives and would not have ensured that the buildings come straight down. Nor could al-Qaeda operatives have obtained command and control of advanced Directed Energy Weapons, Microfusion devices (4th generation mini-nuclear weapons), bunker-busters, or other exotic weapons alternatives that are known to be in the deployment or testing phase in the US Defense arsenal. The controlled demolition and/or Directed Energy Weapons (DEW) or exotic weapons application, therefore, had to be the work of U.S. Government and other insiders. That President Bush was one of those insiders is suggested by the fact that his brother and cousin were principals in the company in charge of WTC security. Complicity at the highest levels of the federal government is also indicated by the removal of evidence (the collapsed steel), which at a crime scene is normally a federal offense. Finally, if the airplane strikes could have occurred only with the consent of the President and the Secretary of Defense (as suggested in the previous point), the coordination of these strikes with the demolition of the buildings - and/or with the use of exotic weapons such as Directed Energy Weapons - implies their involvement in the latter as well. At present, there are several alternative, though not mutually exclusive models of how the WTC Towers fell, in a controlled demolition. While there is compelling evidence for one model over another at this time, the purpose of an impartial forum is to allow evidence to be presented. This includes evidence of traditional chemical means of controlled demolition, as well as more exotic means, as warranted by the forensic evidence. The models of controlled demolition to be explored, thus would include at least: traditional thermite and thermate exposives; Microfusion devices (4th generation nuclear weapons); and Directed Energy Weapons (DEW), be they land-based, air-based, or space-based. Correspondence with the USAF Kirtland Base Directed Energy Directorate does not rule out the existence of Directed Energy Weapons in these configurations. III. Overwhelming evidence also exists for the conclusion that the attack on the Pentagon was an inside job. That the official story could not be true is evident from many facts: Alleged hijacker Hani Hanjour’s incompetence; the choice of the Pentagon west wing as the target; the impossibility of a commercial airliner’s coming back to Washington undetected and hitting the Pentagon unless permitted; and the lack of physical evidence consistent with an attack by a Boeing 757. That the strike was an inside job is implied by the falsity of the official story, the evidence that the strike was made by a military aircraft, the removal of evidence, and the government’s refusal to release videos of the strike. This operation could hardly have been planned without the involvement of Secretary of Defense Rumsfeld. Leuren Moret reported similar elevated radiation readings downwind from the Pentagon in Washington, D.C. on September 11, 2001. Two days after 9/11, the U.S. Environmental Protection Agency (EPA) confirmed that the Pentagon crash site rubble was radioactive and that the probable contaminant was Depleted Uranium (DU). The entry and exit holes through the Pentagon crash site were the signature of a kinetic energy penetrator, such as a Cruise missile, and the term “punch-out hole” was written by crash site investigators over the exit hole. This is a military term used for kinetic energy penetrators. Major Doug Rokke, former Director of the Gulf War I DU Cleanup Team, reported that an email from the Pentagon 30 minutes after impact confirmed a Cruise missile hit the Pentagon on 9/11. Recently vast Uranium deposits have been reported in Khazakhstan and Afghanistan. Khazakhstan is expected to out-produce Canada (now the world's top producer) in Uranium production within 12 years. This exposes the economic interests behind the events of 9/11, specifically the unjustified military attack by the U.S. on Afghanistan using 9/11 as a pretext. IV. Complicity at the highest levels of the federal government is also indicated by President Bush’s remaining at the Florida Elementary school after it was evident---given the truth of the official account---that the United States was experiencing a surprise attack. This behavior makes sense only if Bush and his lead Secret Service agent knew that there would be no attack on the school. V. The complicity of Vice President Cheney in the attack on the Pentagon and the downing of Flight 93 is implied by the testimony of Secretary of Transportation Norman Mineta in conjunction with the false claims of the 9/11 Commission, under the guidance of administration insider Philip Zelikow, as to when Cheney went to the Presidential Emergency Operations Center (PEOC) and when he issued the shoot-down authorization. 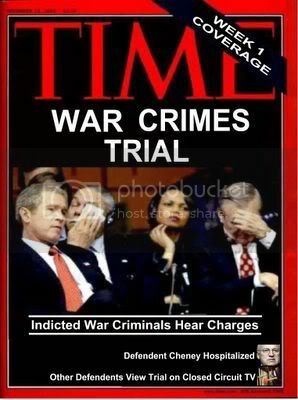 The establishment of an International Citizen's 9/11 War Crimes Tribunal is justified, given that official institutions in the U.S. have failed to assign legal accountability for the False Flag Operation of 9/11. Representative John Conyers, Jr., Chairman of the U.S. House of Representatives Judiciary Committee and his senior staff personally reviewed the 9/11 Independent Prosecutor Act and Congressional Memorandum following the 2006 U.S. Mid-term Election and Senior Staff met twice with representatives of the 9/11 Independent Prosecutor Act. The Chairman refused to introduce the Act, despite support for the Act by his Senior Staff. The 9/11 Commission failed to take testimony under oath from Bush and Cheney, and reached fraudulent conclusions. The False Flag Operation of 9/11 was the pretext for, and an integral part of the planning and execution of the illegal War of Aggression in 2001 against Afghanistan and of War Crimes committed by the United States in Afghanistan, as found by the Final Judgment, International Criminal Tribunal for Afghanistan at Tokyo. The Court found the use of Depleted Uranium (DU) weapons in Afghanistan to constitute War Crimes, Genocide, Crimes Against Humanity, and Omnicide. The False Flag Operation of 9/11 is a legal component of these War Crimes, and the perpetrators of 9/11 are guilty Aggressive War, Genocide, Crimes Against Humanity, and War Crimes. The New World Order!!#!! There goes my career..
i'll have a drink to that and break my sobriety if this is true!!!!!!! After a lifetime of experiences, research and interactions with key players, Webre believes that there is intelligent extraterrestrial life in our Universe. He is the author of the online e-book, Towards a Decade of Contact and the book Exopolitics: Politics, Government, and Law in the Universe. The exopolitics model functionally maps the operation of politics, government and law in an intelligent Universe, and provides an operational bridge between models of terrestrial politics, government and law, and the larger models of politics, government and law in Universe society. interesting hypothesis, similar to my own from another thread some months back - re: we were dropped off to see how well we react to one another when we figure out how to get around the globe... sort of a joke, but not really. abcar, i know that's not the most important point you're making about the 911 war crimes tribunal and Webre. but the wiki article mentions the Disclosure Act, and we recently heard from some dude named Wade about UFO's and politics.... i'm getting curious about how it's all interconnected. Heyy red, well on the point about us earthlings being the only 'intelligent' species in the galaxy..i have serious doubts..we're gonna have to up that quotient to even qualify as reasonably intelligent imo! I hope there are others out there, but that's another discussion...i was just putting this announcement' out there to see it picked apart as only b4ners can..it appears to be the goofy players again..in my novice eyes. If a tribunal ever happened, i would like to see actual human beings from earth tried and held responsible. (and if so..i'll buy you a stiff drink!) And i noticed that they mention these DEW or Exotic weapons...which i know has not really been supported around here from what i've read. But i'm not experienced by any means in the 3ii investigation..so for that i'll defer to the top b4n scientists...but seeing these characters involvement makes me think this is a hype to distract from the real work that needs to be done. Just puttin' out there...if it doesn't warrant any attention i'm sure it'll fade away into thread oblivion. therefore, i have no clue what this tribunal is REALLY all about. In order to prosecute the 9/11 perpetrators under the 9/11 Independent Prosecutors Act, Independent Scientist/DU Radiation Expert Leuren Moret and International Lawyer Alfred Webre will call for the establishment of an International Citizen's 9/11 War Crimes Tribunal, in a public announcement to be made at the Vancouver 9/11 Truth Conference on Sunday June 24, 2007.
what i did find upon googling vancouver 9/11 truth conference was this blog of daily notes taken at the conference. i found it interesting, but naturally, no media coverage to speak of (i don't think). i'm always confused about certain shady characters, or certain names that appear linked with certain shady things... then again, and i think this is also important, it may just be that certain people infiltrate and get indexed with the shady time after time, but there may be a possibility these folks could be "double agents" for the good?? told you i'm no expert... my experience with life, generations before me, and the normal day-to-day conducting of business & politics makes me assume good people can align themselves with bad to get something done. anyone care to see who in this tribunal stuff may be such a character?? i'm still debating having that drink.